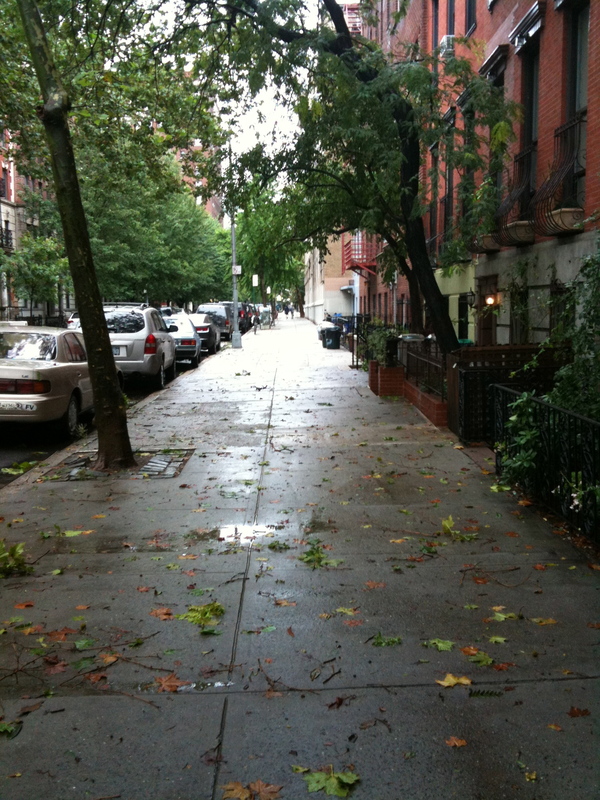 States south seem to have absorbed much of Irene’s force, sparing New York any major damage. Once the maple tree outside my living room window stopped swaying, suggesting that the eye of the storm had passed, I took a walk outside to survey the damage — although we were officially advised not to do so. 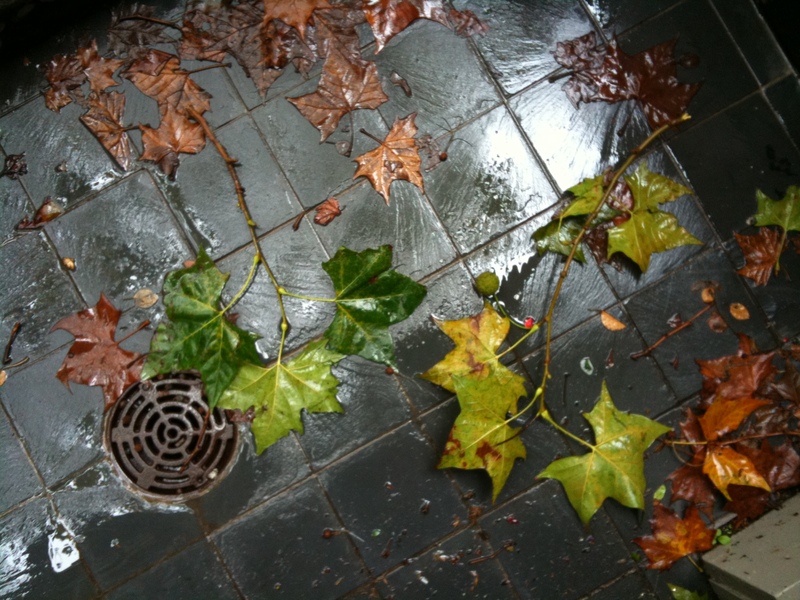 I found only a few leaves and branches strewn across the street and sidewalk. 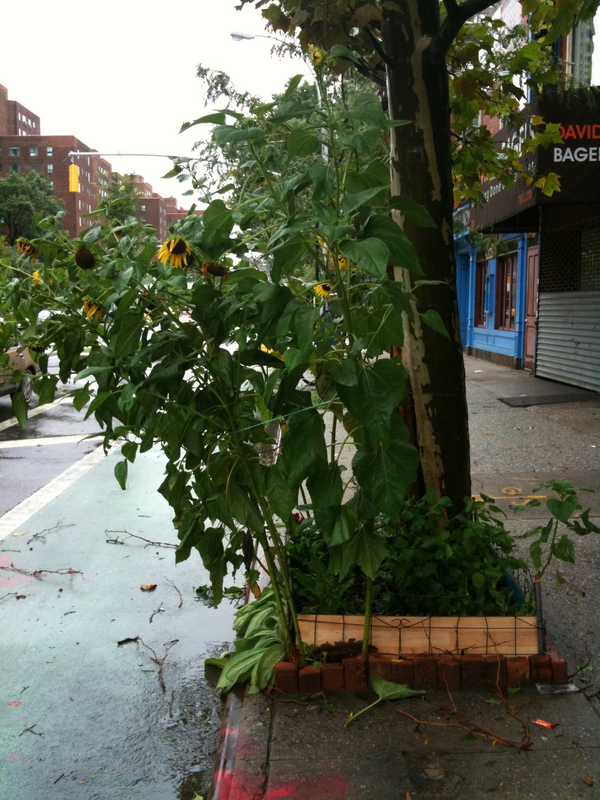 Amazingly, the sunflower patch around the corner remained standing. I expected to be awoken last night by howling winds, rattling windows, or water streaming from a once leak-afflicted area in our living room ceiling. Instead, I was startled awake early this morning by an eerie silence and stillness. Something should’ve been happening, but nothing was. Well, perhaps not nothing. 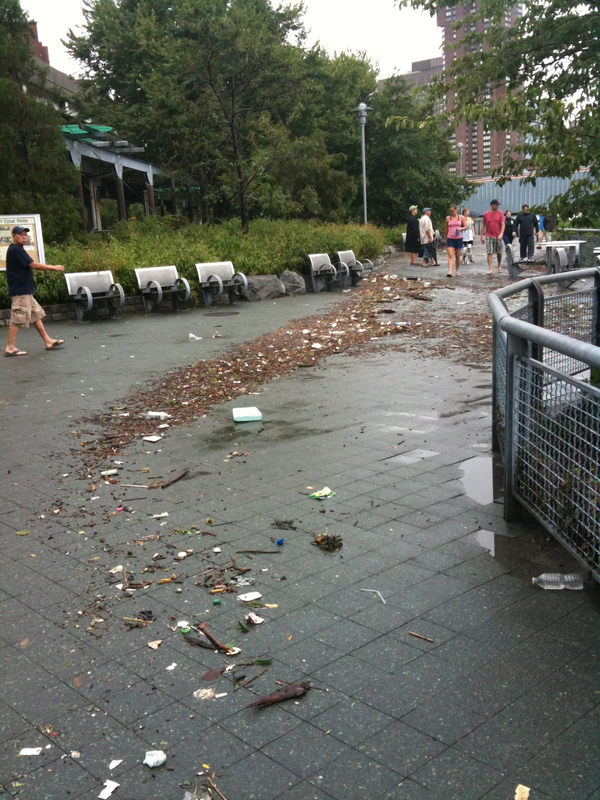 My morning expedition revealed a few downed trees in Stuy Town and flotsam strewn across the walkway along the East River, a sign that, in the early morning hours, the water had risen enough to spill over into Stuyvesant Cove. I’m sure lots of people have experienced flooding. The folks in Coney Island, the Rockaways, and other coastal areas have suffered the inconvenience of evacuation. Others have had their homes or cars struck by fallen trees. The news tells me that there’s still worry over flooding in the subways and subterranean infrastructural spaces, particularly considering the damage salt water can do to aging electrical wires. These are indeed real concerns. The complexity that we have built into our urban systems is profoundly dangerous. Urban systems are extremely interdependent today and we are less able to operate outside of them than ever. But this applies to our personal lives too. Those who have gotten rid of land lines for cell phones got a little reminder during this week’s earthquake of how rapidly such systems are overwhelmed during times of crisis. But even land lines aren’t the same anymore, with voltage-carrying copper replaced by cable and fiber and phones that plug into the wall replaced by cordless phones. We are more and more dependent on electricity and on such systems continuing to run. How many of us even have battery-powered radios anymore? Or maps and compasses to evacuate if data communications are down? 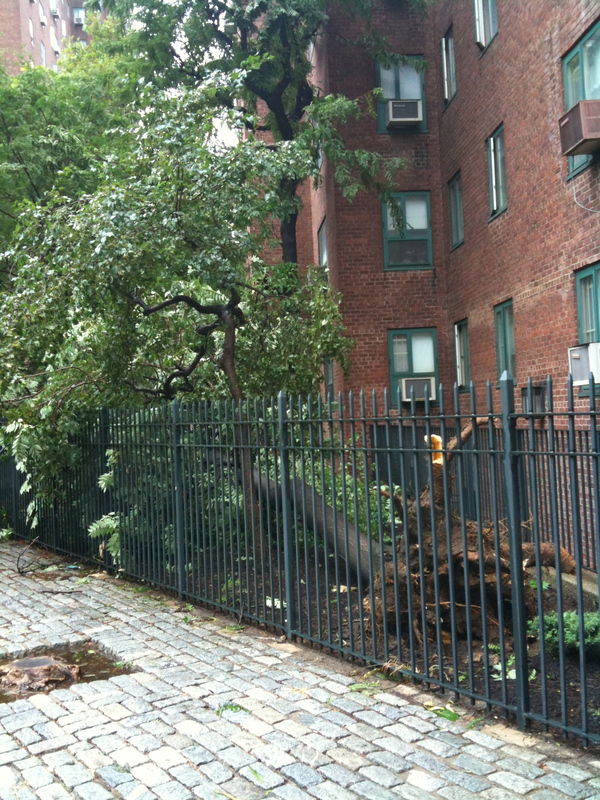 Fortunately, though, for most of us in New York, Irene was a relative non-event. And while I am glad that all those vulnerabilities of our infrastructural networks weren’t seriously tested, I came to appreciate, through hours of television news-watching, other weaknesses created by our very networkedness. The mediasphere’s voracious appetite — its constant demand for new content, for drama — reaches absurd proportions. The past 48 hours have been a case in point. Our local and national media outlets had done so much to hype the storm over the past few days that they couldn’t simply allow the news story to die as quickly as the wind has. A little while ago I saw a local TV reporter standing calf-deep in a puddle outside a well-landscaped suburban home in New Jersey, reporting that although the storm has passed, conditions are still “treacherous.” She called her cameraman’s attention to an approaching car that, upon seeing the sizable puddle, decided to turn around. Treachery indeed! 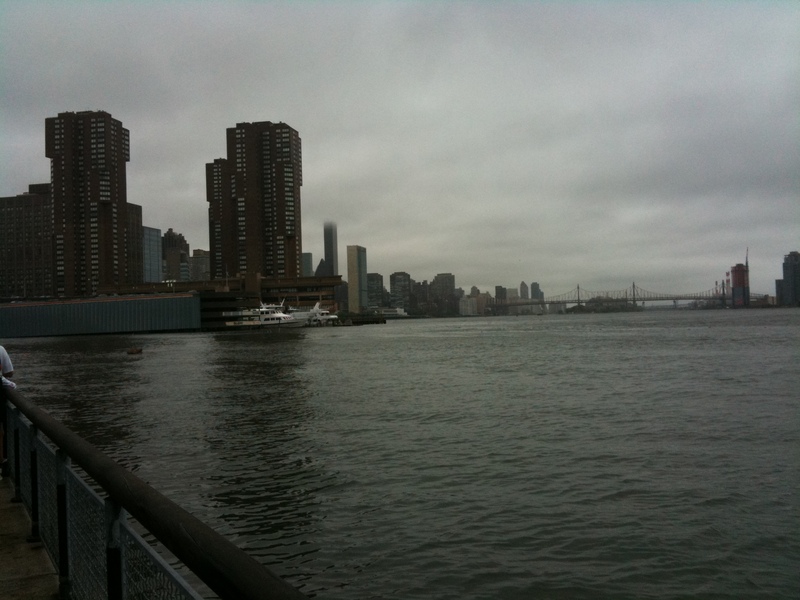 There was a hint of blue sky behind her, and I half-expected to see a rubber ducky come floating past her cute galoshes. I can’t help but wonder what we look like, at least as we are represented through our local media, to the people in North Carolina — or Florida or Mississippi or the Caribbean. In a press conference a few days ago Governor Cuomo, attempting to rally the city, made repeated — and annoying — reference to the old “We’re New Yorkers; we’re tough!” cliche. Judging by our local news, however, we’re a bunch of whimps who cry over big puddles. I’d prefer that the news focused on how fortunate we are that the damage isn’t much greater (I mean, come on: my newspaper was still delivered on time this morning! ), rather than exacerbating the “treachery” of closed roads and “totally shredded” flags (which are apparently prevalent on Coney Island this morning.) Such representations trivialize legitimate disaster and make us look like a bunch of comically fragile, self-absorbed jerks.